It's a fact; whether you like it or not, your face and hands most often reveal your true age. So keep your skin looking and feeling younger than your age with this combination of advanced face and hand creams packed with natural botanicals to deliver extra care and protection to these revealing areas. We want you to look your best, so when you buy this effective combination of Anti-Wrinkle Cream 50ml and Nourishing Hand Cream 50ml you will receive a 30ml jar of our Facial Exfoliator absolutely FREE! From our Award-winning Aroma-Botanicals® range, these luxury skincare creams are a revolutionary step forward in natural skincare, combining the therapeutic benefits of organic essential oils with the beautifying qualities of botanical extracts. A high performance cream to minimise the signs of ageing, featuring rejuvenating oils of Frankincense, Carrot and Rosehip, enriched with protective botanicals of Lady's Thistle and Aloe Vera. This exclusive formulation combats free radicals that accelerate the ageing process and helps to soften fine lines and wrinkles. An intensive hand treatment that conditions and protects your hands, containing oils of Coconut, Myrrh and Elemi, plus soothing botanicals of Primrose and Horse Chestnut. This nutrient rich combination promotes smooth, supple hands and provides effective protection against the environment. Massage over nails and cuticles daily to prevent splits and breaks. Refine and improve your facial skin texture with this creamy scrub containing organic essential oils of Lavender and Grapefruit, Apricot oil and botanicals of Sea Lavender, Irish Moss and Algae. Olive stone micro-beads impart a gentle polishing action, removing dead skin cells and lifting impurities to reveal smoother, more radiant looking skin. But there's a catch - we only have 50 jars of the Facial Exfoliator to give away, so when they have all gone the offer will end. 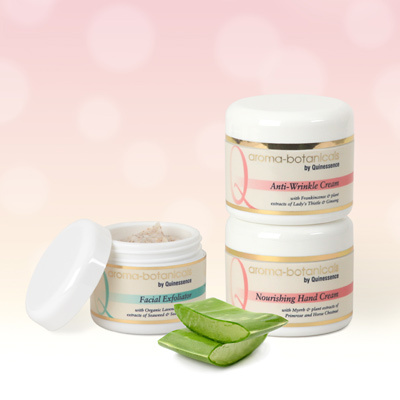 Place your order now and claim your FREE jar of Facial Exfoliator before stocks run out!